Jockey Matthew McGillivray was suspended for a month for his ride on Ef Troop in the Magic Millions Classic. MATT McGillivray was suspended for one month for causing severe interference on Ef Troop in a sensational aftermath to the Magic Millions Classic. Stewards considered laying a more severe charge of reckless riding against the 26-year-old, but said his effort to try and straighten the horse - albeit far too late - saved him from such a charge. McGillivray pleaded guilty. In the incident, Sunlight was tightened, Secret Lady had to be steadied and Hugh Bowman's mount Jonker appeared lucky to stay on his feet after being taken onto the running rail. "I didn't anticipate the turn to come that quickly," McGillivray said. Ef Troop was ridden hard out of the gates and carved out a suicidal 33.65 seconds for the first 600m, so it was no surprise to see him weaken into fourth. Ef Troop's trainer Tony Gollan conducted a one-way conversation with McGillivray as he dismounted. "The instructions were to lead (but you need to) know your sectionals," Gollan said. Stablemate Outback Barbie ran home strongly for third to give Gollan third and fourth, but it wasn't the outcome he had hoped for. "They've both run well," he said. "They will win better races. But it is very disappointing to have this happen today." 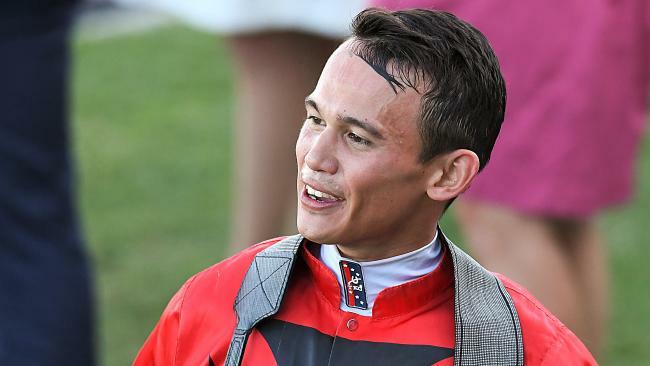 Bowman considered himself lucky to stay on his feet, but in a classy display as he left the course on Saturday night, he shook the hand of McGillivray and said "good luck" in reference to the time stewards would give him. Jim Byrne considered Outback Barbie should have finished closer to the winner. "There was interference early, but she's got an incredible temperament and she seems to be able to absorb that pressure," Byrne said. "I would like to have been two pairs closer and if that had happened I think she would have tested the winner." Sunlight's rider Luke Currie was also suspended by stewards for 12 days for causing interference on Oak Door in the Magic Millions Cup.